Looking for new thrills? 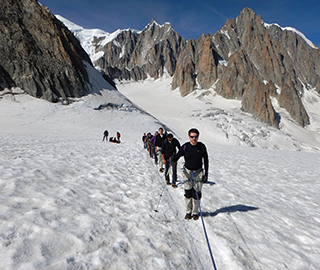 An easy hike deep in the Mont Blanc massif, where ice and the sky blend together, is the best approach to glacier travel and will trigger your passion for high mountain and glacier mountaineering. This program is specifically designed for beginners, with no previous mountaineering experience on glaciers. It will help you to gain the skills needed for glacier mountaineering and to become proficient with an ice axe, crampons and the climbing rope. In addition to mastering the basic of travelling on a glacier, you will also learn some key safety rules. Meeting point: meeting at 8:00 am at the Skyway station for equipment check and a short briefing. Depending on the physical preparation of the participants we will decide whether to head to Colle del Gigante, Colle d’Entreves or just to some corner of the glacier to admire up close the vertical granite towers that surround it. During the hike the Mountain Guide will give you some information on the mountain environment, touching upon geology, glaciology and mountain meteorology. You will also learn the basic techniques for travelling on glaciers safely and comfortably.